Matching Dragoons: Jonah Hex #29 "The Innocent"
Jonah Hex #29 "The Innocent"
Jonah is a pallbearer at a funeral for Bob Jensen. After the funeral, Jonah is talking to Bob's brother, George, and is introduced to Bob's 11 year old daughter, Melissa, and Bob's second wife, Ruth. Jonah and Bob were friends years ago hunting buffalo for the Army. Jonah asks how Bob died and George explains that Bob fell off Hanson's cliff when the edge gave way, spooking his horse and throwing him over the edge. Nearby, the Curly Wilson gang is hunting Jonah down. Ominous! Later that evening, Jonah is finishing up dinner with the Jensen family and then he retires to his room. Much later, Melissa sneaks into Jonah's room and tries to wake him up but finds just a bedroll under the covers. Jonah tries to send her back to bed but she starts crying, asking if Jonah really knew her dad. She then tells Jonah that her dad was murdered, he was such a good horseman, there was no way he could have been thrown. Jonah starts questioning her, but Ruth comes down the hall and tells Melissa to get into bed. Shortly thereafter, Ruth meets George outside and relates that she heard Melissa talking to Jonah. They are concerned that Jonah may learn the truth, but then the Curly Wilson gang shows up and having overheard the concern regarding Jonah, Curly offers to kill Jonah Hex for the tidy sum of $10,000. George agrees to pay it. The next morning, Jonah goes to inspect the cliff that Bob fell off of. The edge is solid rock and Jonah cannot find any evidence of it giving way. Later that night, Jonah end up exhuming Bob's body, making mention that it's a good thing that they bury folks shallow in this area due to the underground rivers (important point for later!) 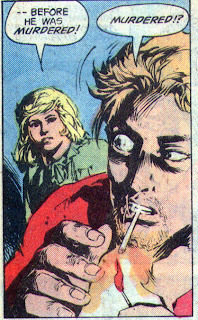 and finds that Bob is sporting a bullet hole in the middle of his forehead. Just then, the Curly Wilson gang shows up, cracks Jonah upside the head with a pistol and then they toss him in the casket with Bob and bury both of them. Back at the Jensen house, the Curly Wilson gang is ransacking the house and terrifying George and Ruth. Jonah walks in and shoots all three men in the gang and then demands to know why they murdered Bob. George & Ruth explain that it wasn't them. Then Melissa walks in holding a pistol and tells Jonah that she killed Bob. She did it because Bob took another wife after Melissa's mom died. Jonah asks Melissa snuck into his room that night. She says that she wanted someone to punish her but now she has changed her mind. Now she is going to shoot Jonah, George and Ruth. She pulls the trigger and barely wings Jonah. Hex grabs the pistol and smacks the little girl a good one. George explains that they didn't want to turn Melissa over to the sheriff and have her end up in an asylum. Besides, George & Ruth are working as her jailers. Melissa apologizes to Jonah and asks if Jonah is mad at her. Jonah states that he isn't and then rides off into the night. We see that she died in 1870. 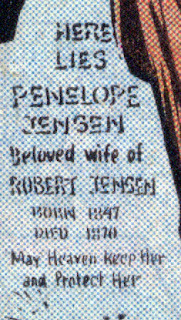 George says that Melissa is 11 and Penelope died when Melissa was 6, therefore it is now 5 years later of 1875. Surprised? Of course you are. This was a real yawner of a story that I could never really get behind. Not a whole lot happened and I actually stretched out the narrative on this one as long as I could. 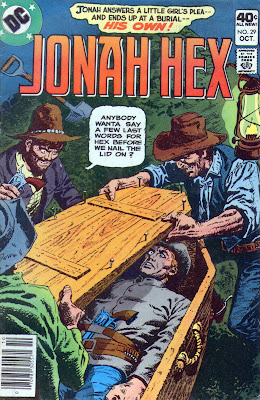 I would probably only read it in order to say that I have read every Jonah Hex story. Otherwise, I would pass on it. Next Issue - Jonah in the Civil War, Michael Fleisher appears to forget a major past storyline and we get to see the birth of a bounty hunter. Sheesh, that's one messed-up kid! Bet she grows up to be a charmer! But the scene in the graveyard is indeed a hoot.